– Preheat oven to 350F/180 C.
– Process Oats in Food processor or Blender until they are the consistency of coarse flour. – In small bowl, mix Oil, Syrup, Lemon Juice and Vanilla. – In a separate bowl, place ground Oats, Poppy Seeds, Coconut and Lemon Zest. Sift in flour, Baking Soda, Baking Powder, and Salt. – Pour wet ingredients into dry, and mix with a spatula until well incorporated. – Using 2 spoons, scoop out 1 heaped Tblsp. of batter onto lined cookie sheets. Flaten cookies slightly with bottom of a cup or glass (Dip in warm water before). – Bake for 11 mins. then rotate cookie sheets a half turn (to ensure even baking), and bake 5-6 mins. 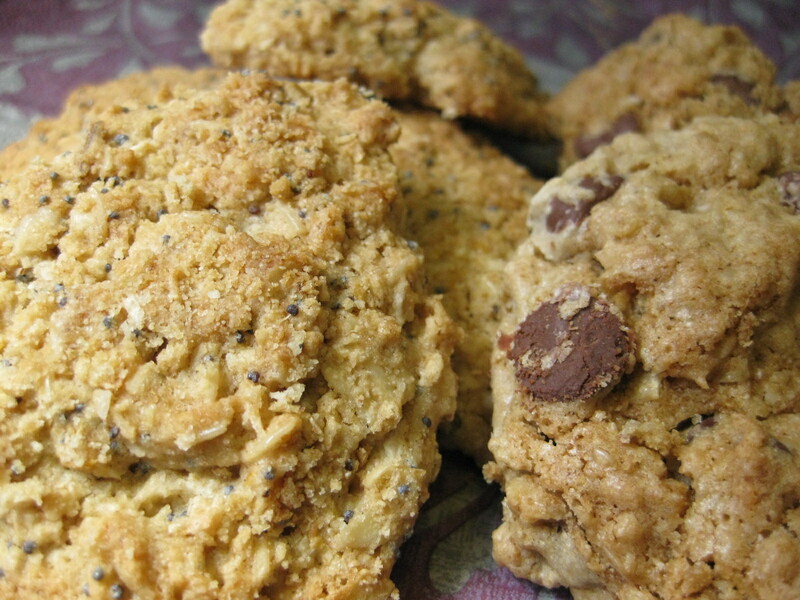 more – until cookies golden around the edges. – Let them cool on the cookie sheet 5-6 mins. and then remove onto a cooling rack. – Follow method for previous cookies (Lemon poppy-coconut), only processing 3/4 cup of Oats, and adding the rest whole to the dry ingredients.